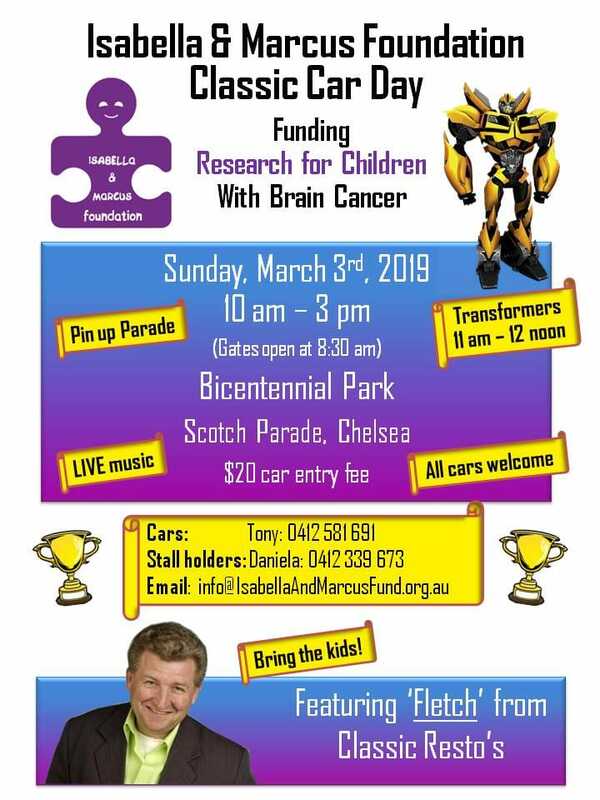 The Isabelle & Marcus Foundation Classic Car Show was held at Bicentennial Park in on Sunday 3 March 2019. All proceeds went directly to the Isabella and Marcus Foundation to fund research that will develop treatment for children with brain cancer. The show is supported by a wonderful team of volunteers who give up their day to make this event a success. The Isabella & Marcus Foundation Classic Car Day has truly grown over the past 8 years. This event began in 2011 in a small warehouse in Mordialloc with 70 cars. It stemmed from Tony’s (Marcus’ Dad) passion for classic cars or as Marcus would call them “hot cars”. By the second year the event had doubled in size so the search was on for a bigger venue to accommodate the growing interest from car enthusiasts. The City of Kingston kindly offered the charity a scenic back oval in Bonbeach, which was absolutely fantastic except the venue proved to be a logistical challenge to safely move cars in and out of a very narrow entrance! There were long queues to enter and the patience of the 400 plus enthusiasts that had to queue for a lengthy period to enter was beyond belief. This support from the classic car community of Victoria was quite moving to us. After two years at the Bonbeach site, traffic management was improved. The council offered an even bigger more car friendly venue at Bicentennial Park in Chelsea. This site offers 3 larger ovals and additional space for public parking, and is now the Home of the Isabella and Marcus Foundation Classic Car Day. The event attracts 500 plus classic cars from all eras and welcomes all types of cars. About 2000 people of all ages come to enjoy the cars and be entertained. It is a family orientated, day filled with live music and lots of entertainment, including jumping castles, an animal farm, pony rides, face painting, tattoos, the local fire brigade, an AFL Specky machine, market stalls, food, Major Raffle, Pin-up parade and the Transformers pay a special visit which is always a high light for young and old. Picnic blankets are laid out for parents to relax while soaking in the atmosphere. This is all made possible by the wonderful classic car community that come along to support this event year after year, raising funds for vital research into brain cancer in children. Many car clubs support this event by way of donations from their own separate planned fundraising event.